Ever notice how almost all metal tools and kitchen utensils have been farmed away to be made overseas? No matter how domestic-sounding the name, such Kitchen-Aid or Calphalon, when you look at the label, it invariably says “made in China”. With a few notable exceptions, such as Rada Cutlery that I recently reviewed and Epicurean cutting boards, just about everything in your kitchen is imported. So I was quite pleased to be contacted by Sean from jacobbromwell.com. They are a manufacturer of authentic and traditional kitchen and campfire gear, making these products the same way they were made decades ago, by hand. They make kitchen utensils such as stove-top toasters, shredders, graters, and flour sifters. The really cool thing about these products is their handcrafted, unique and retro feel. 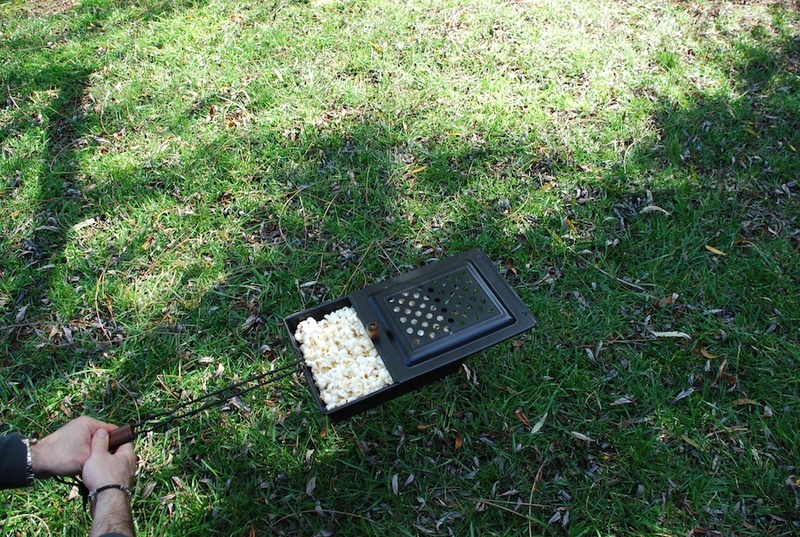 I sampled the campfire popcorn popper (see picture below). This is definitely a fun utensil to enjoy either in the kitchen over the stove or in the backyard over the barbecue or campfire. It has a long handle to keep your hands away from the heat. The fresh popcorn was awesome of course. This is the popcorn popper I used to make this popcorn - Just like the American pioneers did! In this era of offshoring of production, especially as regards metalworking, it’s refreshing to see a company, such as Jacob Bromwell, not only resist that temptation, but to bring back traditional American metalwork. Not only that, but this is a celebration of hand-craftsmanship. When you buy a product made by hand by an individual, in your own country, that item will have special value to you, unlike the mass of junk that we buy at Target and Walmart which goes into the trash after one year of use. Whether you are looking for made in USA kitchen utensils, made in USA campfire gear, or made in USA fireplace utensils, please check out jacobbromwell.com.